Also known as macchinetta—“small machine” in the tongue of its Italian inventor, Luigi De Ponti—the Moka pot hasn’t changed much since its invention in 1933. The simplicity of this stove-top marvel, which makes coffee by pressurizing boiling water and passing it through coffee grounds, has made it a classic. Nevertheless, while a darling in Europe and South America, this delightful contraption is only now picking up steam in the United States. With its iconic design, the Moka pot manages to combine convenience with the feel of luxury—one possible explanation for its growing popularity. Users should be aware that with the Moka pot, it is possible to actually cook your coffee, thereby ruining its flavor. Can I Use the Moka Pot? This shouldn’t prevent newcomers from trying their hand at this brewing method. Even if you don’t have espresso experience or equipment, learning how to use the Moka pot doesn’t take long. “If you follow the instructions, and keep an eye on the temperature, it’s fairly easy, even for beginners, to produce delicious results with this method,” Benjamin says. Step 1: Grind about 20-22 grams of coffee, about as finely as you would for a shot of espresso. Step 2: Fill the bottom half of your Moka pot with water that’s fresh off the boil. Step 3: Fill the pot’s filter basket with the ground coffee, and give it a shake to settle the grounds evenly. Place it into the bottom compartment. Step 4: Screw on the Moka pot’s spouted top. Step 5: Place the pot on a stove set to medium heat. Step 6: When the water in the bottom chamber approaches a boil, the pressure will push a stream of coffee slowly and methodically through the upper chamber. If it explodes upward, your water’s too hot. If it burbles lethargically, turn up your flame. You'll know it’s done when you hear a hissing, bubbling sound. 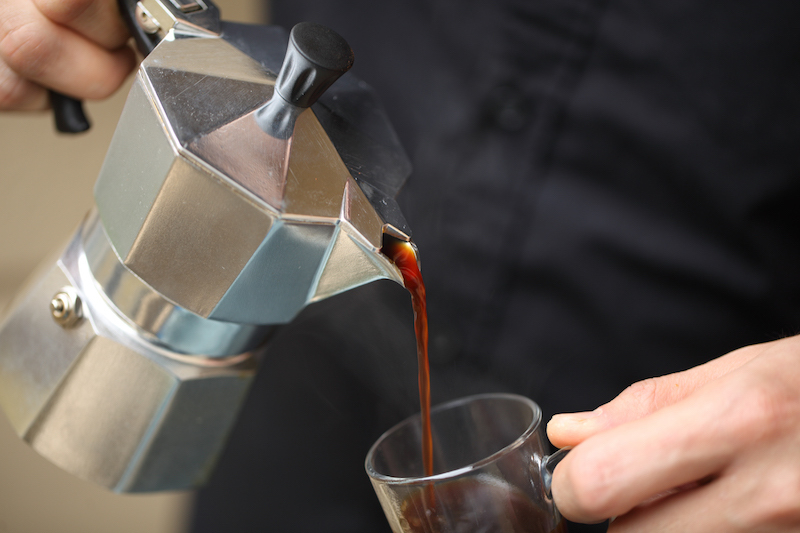 Find the full Moka Pot Brew Guide on our website.